1. What are the health impacts of air pollution? Air pollution is much worse than most of us have realised. When compared to other environmental factors affecting public health only smoking causes more early deaths in the UK. Worse still, the health impacts are concentrated in busy urban areas such as London. For more information on the health impacts of air pollution click here. 2. What is the legal situation? Legally binding, health based standards for air quality have been set by the European Union. The UK is cheating on these air quality laws and misleading the European Commission. For more information on the legal aspects of air pollution click here. 3. Where does air pollution come from? Road transport is the dominant source of air pollution in London. Other important sources include domestic and industrial combustion, for example central heating boilers. For more information on sources of air pollution in London click here. The solutions to poor air quality are within our grasp – no new technologies need to be developed. Scrappage and retrofit (for example, fitting filters) schemes for older vehicles and boilers are needed, as is a move towards electrified transportation in central London. In the most polluted areas more low emission zones are needed to exclude the biggest polluters and protect health. The UK Government also needs to play its part by providing the funding and national frameworks needed for the Mayor and the London Boroughs to act. Above all the UK Government must achieve full compliance with EU air quality laws before fines become payable and develop an appropriate strategy for doing so. 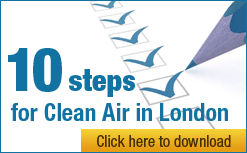 For more information on the solutions to air pollution in London click here.